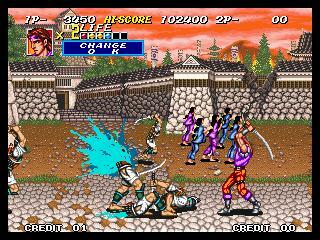 When I think of Sengoku, I think, "Whoa, that really old side-scroller that I always want to buy but never get around to it." But I have played it, many, many a time. It's a wonderful game. It's not too expensive ($70 on AES) and is a nice addition to everyone's collection. Wow! I would call this the "Metal Slug 3 of 1993" The graphics in this are very nice. The characters don't look so "YAAAAHOOO!!" kind of cow-boy style. You start with a sword which can get numerous power-ups by killing enemies. There are two kinds of slashes; one that spills guts from the front, and one that spills 'em from the side. Very nice. Everything is very fluid and the backgrounds are simply GORGEOUS! 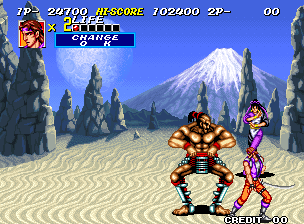 In the first level, a Japanese woman that seems to have authority, says something to you (I played the Japanese version) which I assume means, "Go find (item or character here) The whole world is counting on you, (character's name)" And you go onto a roof, come face to face with a dragon, and fall through that roof. The background is children and woman screaming and fleeing from the dragon that is setting the village aflame while crows fly around the screen. Excellent graphics here, they flow well. Not bad, a simple program: A- Slash B- Side Slash C- Jump D-Morph. Not bad at all; however the joystick's a tad sluggish. This is one of my all time favorite Neo-Geo games, and everyone deserves a try at it. It looks nice on your shelf and is a wonderful addition to any Neo-Geo collector's collection. 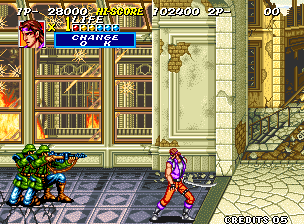 It's an insane addition over the first, and if you want to relax and sit down with some classic Neo-Geo, pop in your Sengoku 2 cart.